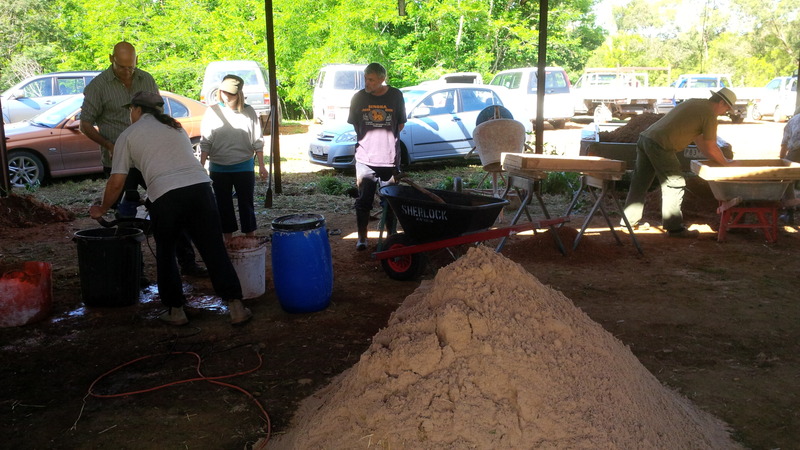 23 March 2016 – Last November, I attended a series of workshops on straw bale construction. So glad I did! It was fun, further opened my eyes to the merits of another alternative home construction technique, and showed me that it’s not so complicated where it’s out of my reach. We first learned of ECOSS a year ago at their annual spring festival, which we returned to again in October 2015. There we met Tom Neil, who was promoting a series of alternative building workshops, the first two of which would be straw bale and hempcrete. His vision was to a create a very hands-on course as opposed to many of the more theory based workshops you find. Paul Fox was the guy brought in to teach the straw bale workshop. 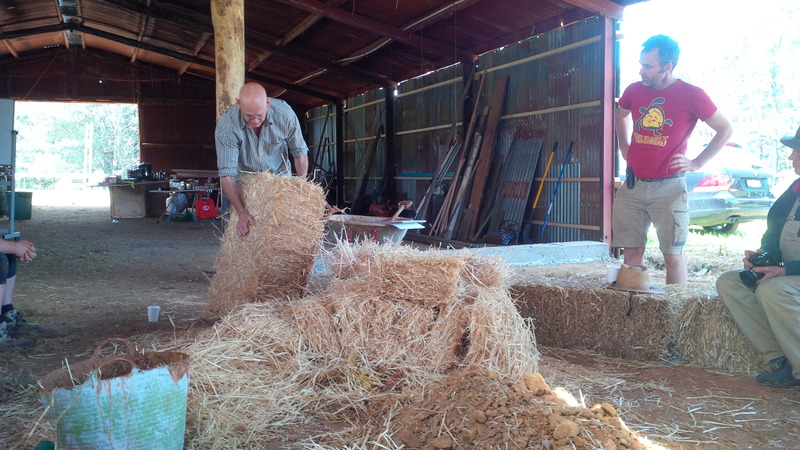 He has a vast amount of experience building straw bale homes commercially within Australia. He’s experimented with just about every technique and currently places a high focus on efficiency and building them to have conventional looks (flat surfaces, straight lines, sharp edges) as opposed to the earthier versions that are harder to sell. His reasoning is that this is an excellent form of construction, far superior than convention stick frame construction, and that the best way to promote the technology is to build homes that most people would want to live in. His mantra is building homes that people will be able to live in for generations, and the straw bale home is one such home that stands the test of time. Straw bale construction, as the name implies, refers to building structures using straw bales as a principal material. It is primarily known for its excellent insulative qualities. Unlike high thermal mass building materials that use items such as the rammed earth of Earthships, the mud-bricks of David Holmgren’s Melliodora Homestead, or other materials like concrete and stone, straw bale prevents heat from escaping your house as opposed to actually holding the heat itself. Think of high thermal mass objects as collectors of heat and natural radiators, and think of good insulators as force fields that stop heat from passing through. In the picture below, you can see a thermal image of a conventional home vs a strawbale home. On the left, the conventional stick frame home allows easy conduction of heat through its materials (drywall, 2×4’s, insulation, plywood, etc. ), whereas the straw bale home on the right has a virtually impenetrable wall of insulation. The only ways for heat to escape the house are through windows and doorways. The difference in heat loss is simply amazing. 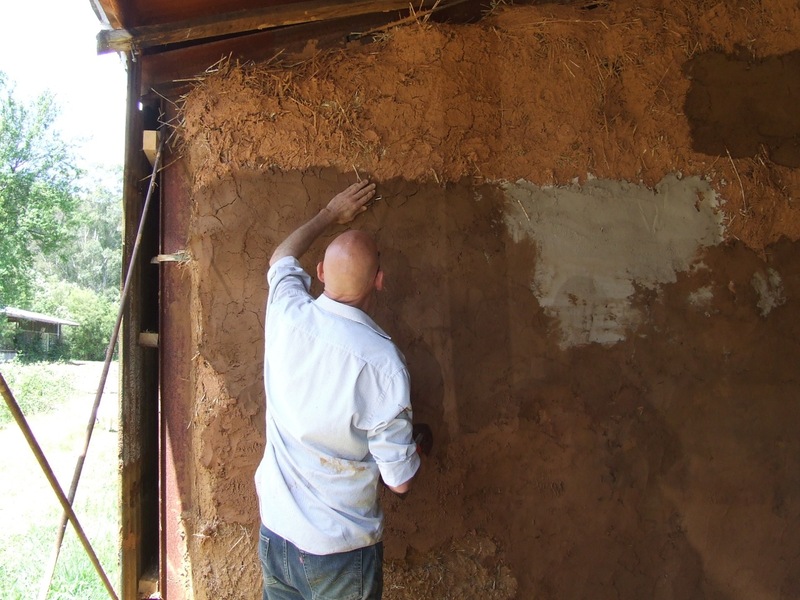 Clay renders used to seal straw bale walls naturally take in moisture from the air when it’s humid and release it back into the air when it’s dry. This actually makes straw bale homes naturally dry and comfortable inside even when it may be humid outside. The first thing people usually worry about with straw bale homes is that they would easily catch fire. Although a naked bale of straw bale will certainly catch fire if you take a match to it, when it is compressed and rendered over with clay it becomes impervious to the outside air. There simply isn’t enough oxygen inside the wall once it’s been rendered to catch fire. Paul also mentioned that a test had come out recently where they showed straw bale homes survive better against fire than brick veneer homes. However, I couldn’t find the study online. Another worry people have is that rodents are going to be attracted to all that straw stuffed in the walls. However, it’s important to realize the difference between straw and hay. Whereas hay is a nutrient-rich crop used as food food for livestock, straw is simply the leftover hollow stalks of certain grain crops. 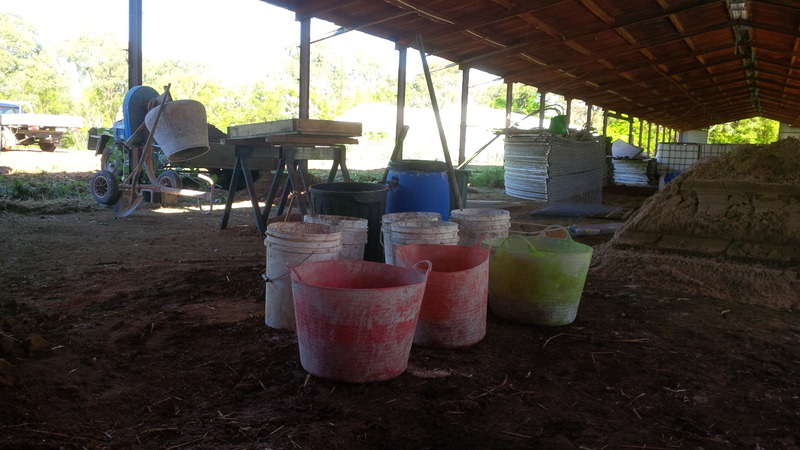 It is very low in nutrients, very low in moisture content, and typically only used as bedding. 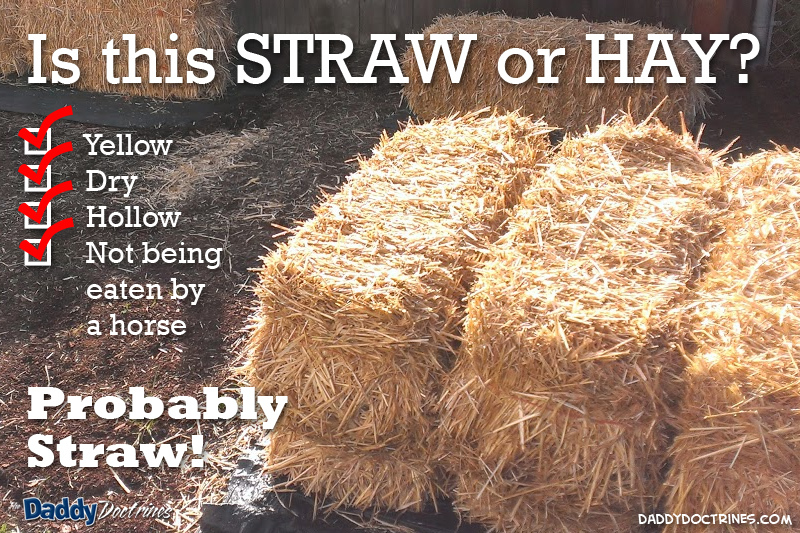 In fact the expression “Hay is for horses” comes from the fact that they will simply refuse to eat straw because it is so undesirable. Because straw is so low in nutrients, animals naturally don’t bother eating it. The same holds true for rodents as it does for horses. Therefore, rodents typically do not hang out in straw bale walls. The main approach to be taken when building with straw bale can be divided into two main categories: load bearing and infill. Load bearing refers to the fact that the straw bale itself will form the primary structure and bear all the weight of the house, especially when it comes to the weight of the roof. Infill refers to a technique in which a traditional wood frame house is erected and then straw bale is infilled to provide insulation, further stability, and the overall look and feel. Although Paul has built homes using both techniques, he prefers infill for its simplicity and efficiency as well as for the fact that infill has less embodied energy because the bales don’t need to be mechanically compressed. As such, this was the technique we practiced during the workshop. I could also relate to this the best since any construction projects I’ve been involved with will more closely resemble this technique. Clay is a stiff, sticky fine-grained earth that can be moulded when wet and that can be dried and baked to make bricks, pottery, etc. It is also a critical component of the straw bale construction process because it becomes the render used to seal in the straw and give the walls the final finish. It affects not just the functionality of the wall, but the look and feel as well. For me, getting the clay right is the most foreign and daunting piece of the puzzle simply because it is so far outside my expertise. That being said, this headache could be avoided if you were willing to throw money at just buying clay in and not sourcing it from your own property. Add water to the soil and see if it can become a meatball or sausage without breaking. Let the meatballs and sausages dry and see if they crack. Rock hard is very good, some cracking means you may have to add sand, and crumbling means terrible quality. Put some soil in a mason jar, add water, shake, and allow the settle. If distinct layers separate out then this is a good sign. 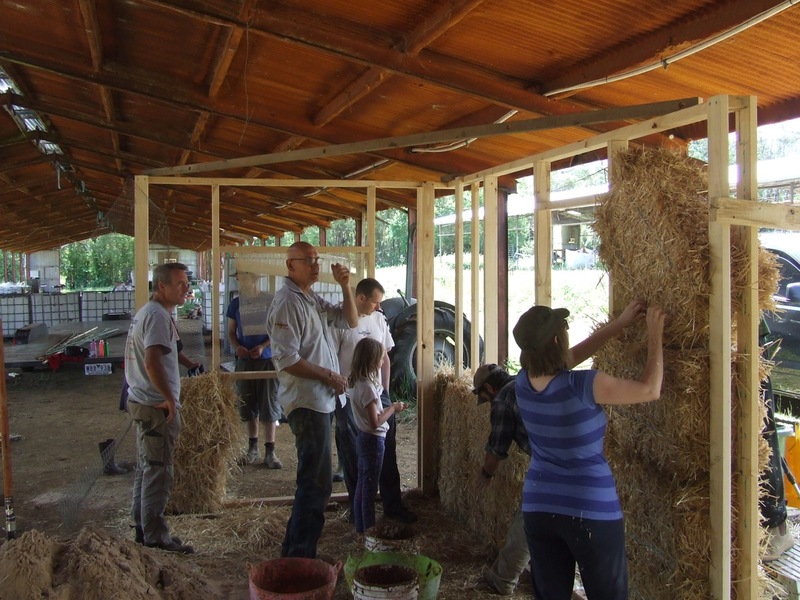 Because you’re building a house using straw bale, you don’t just want to use any old bales. The best way to do so is to lean on the bales and see if the strings go slack. If they go slack, it means there’s not as much hay and it’s going to have to be compressed quite a bit. Sometimes, hay balers will essentially cheat their customers by making loose bales. Not only does this mean you’ll have to buy more bales to build your house, they will not stack and compress nearly as squarely, which will result in uneven surfaces. Once you have determined the bales are of good quality, it’s advisable to buy them all from the same source at the same time if possible. This will help ensure uniformity across all the bales, which will make construction considerably easier. Before a wall can go up, a proper footing should be laid so as to protect the straw from any moisture that may end up on the floor, as well as to create conduits to run utilities. During our workshop, we ran three pieces of wood along the length of the floor, which will provide a surface to nail skirting (trim) into while having a groove that cables can be run under the bales. 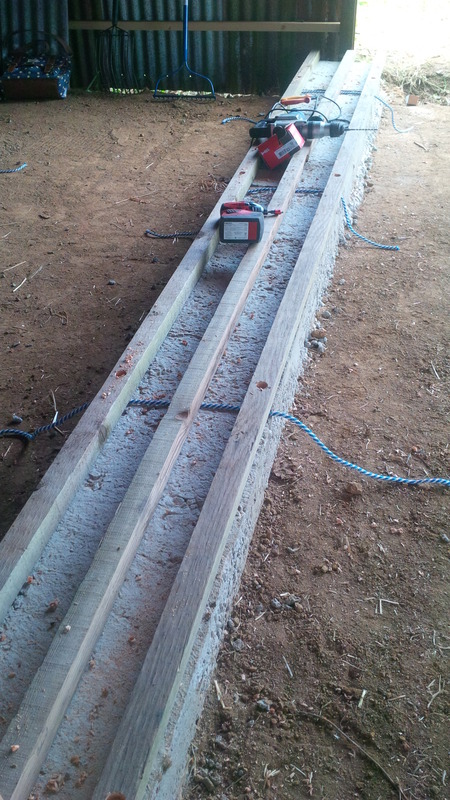 The wood is spaced so that the footing will be 15mm out from the surface of the bale. This is the typical amount of space that the three layers of render will take up and will therefore allow a flush transition between the footing and the surface of the wall. Bales will need to be compressed by about 5-8%, although this number may be higher if you have really loose bales. Therefore, studs should be spaced about 5-8% less than the width of a bale. This will provide horizontal compression once stacking. For example, for a standard size bale that is 900mm in width, studs may be spaced approximately 850mm apart. After studs go up, stack the bales so that as flat a surface as possible is maintained. The flatter a surface you start with the easier it will be to achieve a nice flat surface during rendering. Every couple of rows run a 2×4 length wise, compress the bales vertically, and nail them into the studs. The higher you go, the less important it is to put these extra 2×4’s in since presumably less force will be exerted against the wall (people leaning against it, etc. ), but it’s probably not a bad idea to keep doing it anyways. If running the wall up to an angled roof, put in 2×4’s vertically to the roof to give yourself sections that you can fill in with loose straw to finish it off. Once the wall has gone up, it’s time to apply the first coat of render. The first coat will be clay and water and the purpose will be to create a relatively flat surface that the second coat will be able to mechanically bind to. The render should be very thick since it needs to stick to the straw. Render should be applied by hand working from the top of the wall to the bottom. Each clump of render that gets applied should be put on by working towards the top of the wall so that it sticks to itself via gravity as you push upwards. The render should only be thick enough to just cover the hay. The thicker it gets the longer it will take to dry and the more cracking that will occur. Remember that clay shrinks when it dries, so the more material you add the more shrinkage will occur. Try to minimize how many pieces of straw are sticking through the render and take great care to create as flat a surface as possible. This will save lots of frustration in the second and third coats. When holes and other imperfections happen in the bales, “cob” can be used to fill them in. 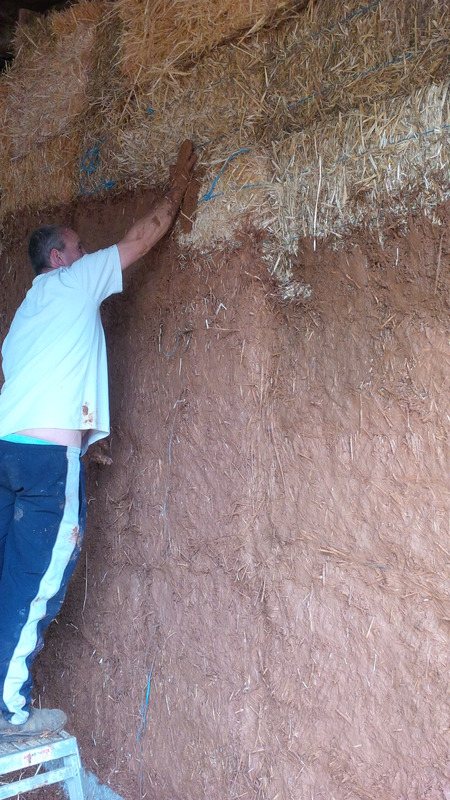 To create cob, simply dunk some loose straw in the render mix so that it’s wet. Ball it up into roughly the shape of the space you are trying to fill, and stuff it in. Allow the first coat to dry. Depending on weather conditions and thickness it could take anywhere from a day to a week or longer. Sand will provide the strength of the second and third coats. If thinking of it in terms of brick and mortar, sand will become the brick and clay will become the mortar. Generally, “sharp” sand is better because there will be fewer gaps between individual grains of sand. Soft sand is silkier and feels nicer running through your fingers because individual grains have a rounder shape. Sharp sand will feel coarser and clumpier and individual grains are more like oddly shaped fragments and therefore compact down better. It’s also worth noting that the color of the sand will greatly affect the final color of the surface being rendered. Very light sands verging on white are probably best unless you are going for a really earthy look. The second coat is what will provide the strength of the render and will be approximately 20mm in thickness. 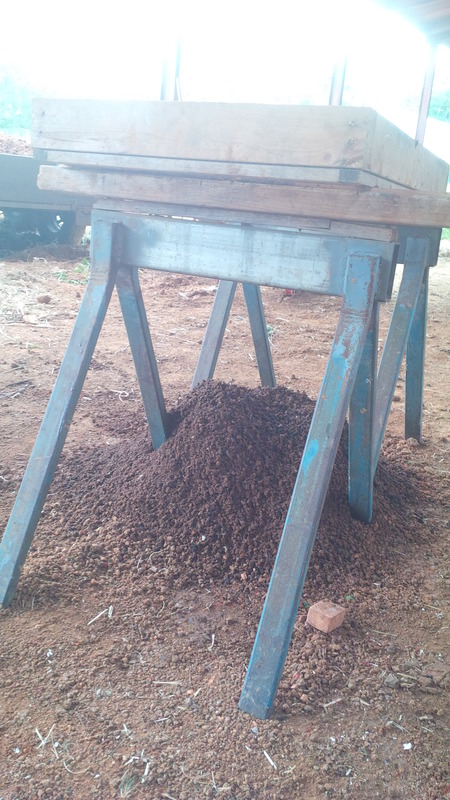 To determine the appropriate mixture of sand to clay, a few tests will be run before beginning work. Start with the same clay/water mixture as the first coat and use it to create varying ratios ranging from 1:1 to 2:1 sand to clay. It should be as dry as possible and still easy to work with, and should stay stuck to your hand when turning it upside down. Test each ratio on a 1 square meter section of wall. Additional sand may be required if there is lots of cracking in the first coat. However, keep in mind that some cracking is desired because it means the clay content is good. A float will be used to apply the second coat. Start by using the tip of the float to create a horizontal line as high up on the wall as possible. Working from the top of the wall to the bottom, apply each render stroke in one smooth motion that works from bottom to top, left to right. If needing to smooth out imperfections, work the float very quickly (but without much pressure on the wall) from side to side. The importance of a smooth first coat becomes very apparent during this step because the second coat should be as uniform as possible in its consistency. The third and final coat will provide the desired asthetic. A much higher ratio of sand to clay will be used in order to give it a good level of hardness, and the thickness of the application should only be around 3mm. 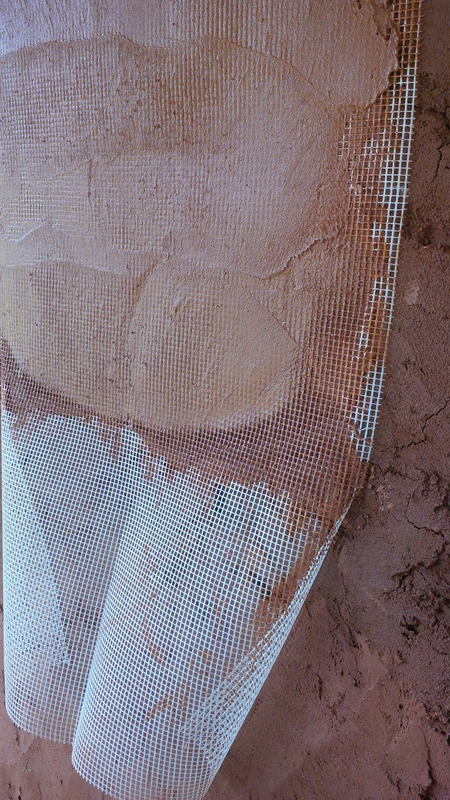 Since the clay concentration is so low, a layer that is too thick will likely crumble off. Remember, the first two layers are doing all the work – this one is just to finish off the look. Use a technique similar to the second coat but remember that since this is the final coat any and all imperfections will be visible. Once the coat begins to get leathery (meaning you can touch it without leaving fingerprints), go over it with a flat, flexible float to work away any stroke marks that were left behind from the final application. Apart from putting up a basic wall, no doubt window and door frames will need to be considered as well. Paul advises using “render’s mesh” around door frames and in between the first and second coat. In fact, some people even use render’s mesh on their entire project. Although it adds rigidity, the expense can add up so it’s only really required when doing detail work. Another material that can be used is chicken wire, which may be more optimal for achieving well defined edges around corners since you can bend the wire. Use a staple gun to secure the render’s mesh and/or chicken wire. Since shelves, pictures, cabinets, etc. cannot be secured to earthen renders, this should be taken into consideration during planning. The easiest solution is to build cabinets and shelves up from the floor no different than a dresser or another piece of furniture. You can also build shelves into the wall before rendering by putting them in between bales but sticking out into the room. Pictures can be hung from the ceiling or placed on shelves. Some people pre-place and secure a metal hole that shows through the render and can be screwed into, although this requires advanced notice of exactly where you want pictures. Electrical conduits and piping can be run through the straw bales and secured to studs no different than conventional construction, although you must remember to leave enough room for the render when placing outlet boxes. During one of the days of our workshop, we visited a straw bale home in the local area. It was an owner-built home by a woman who runs a local coffee shop. The house was divided into two main structures connected together. The house needed to grow once her family did and you could tell she learned a lot on the first go. One thing she learned was that it’s not worth going for a textured look. Many people leave flakes of the straw in the final render to give it that extra earthy look. However, these pull away as time goes on and create imperfections in the surface that can allow water in. She has spent a lot of time over the years patching up these holes. On the second go, she created a much smoother surface much like those that Paul teaches. Another thing that she learned through building her home was to make sure you are careful in selecting your contractors. Many people do not have experience building straw bale homes and are naturally skeptical of them. She ended up constantly fighting with contractors and eventually wasting quite a bit of money fixing the work they had done because they weren’t open minded enough to unconventional building techniques. She later found contractors that were actively interested in what she was doing and willing to “think outside the box” on the project. Working with somebody bought into the idea was much more productive and this should not be underestimated. One worry with straw bale of course is keeping it protected from moisture. Paul advised using oil to protect the house against water. Oil, because it naturally repels water, will effectively create a protective layer between the top coat and the elements. Thought should also be placed into the amount of overhang on the roof so that the exterior of the house is protected from rain as well as possible. Doing the straw bale construction workshop was a lot of fun, and it gave me confidence that I could figure out how to do this if I wanted. Straw bale certainly offers advantages over other construction materials when it comes to insulation. 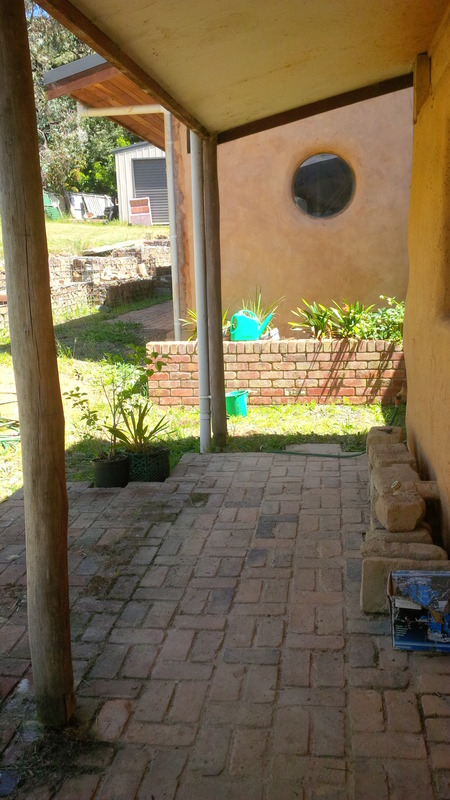 I liked how the house we toured used straw bale for the exterior walls and mud brick for the interior. This combination uses the straw bale to prevent heat from escaping the house while using the high thermal mass of the mud bricks to store and release heat on the interior throughout the day and night. Regardless of what I end up using on our house some day, this much is clear: the way conventional stick frame homes are built don’t make sense. They are incredibly energy inefficient and not built to really last, yet we’ve been doing it that way long enough now where most people (myself formerly included) automatically assume it’s the right way to do things. I look forward to some day getting my hands dirty on my own sustainable home building project.